If you like to test your web sites on mobile devices, there´s now an easy way for doing so: Go to the App Store or Google Play Store and download the free MAMP Viewer App. 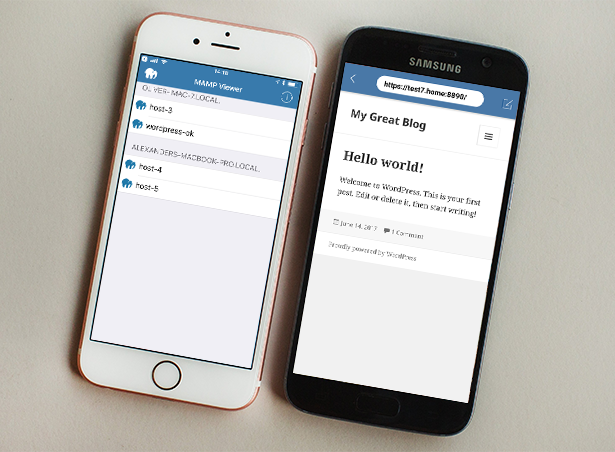 With MAMP Viewer and MAMP PRO you have the perfect tools for mobile development. 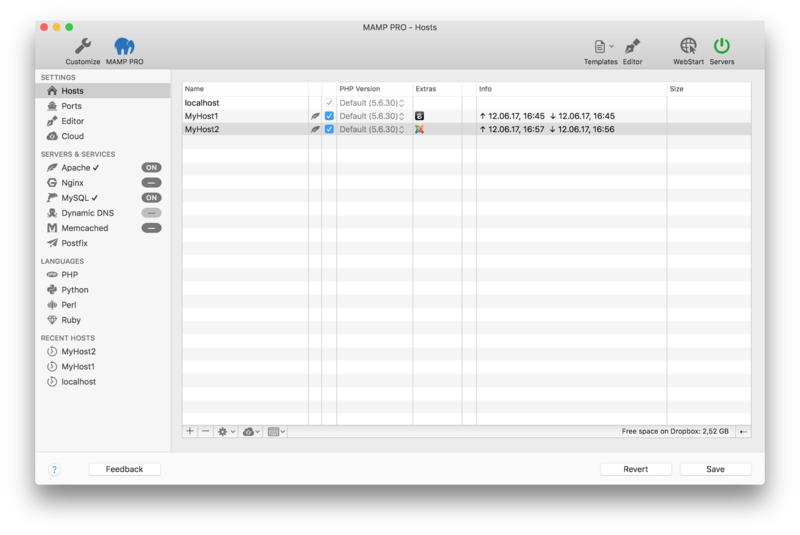 We have released a public beta version of MAMP PRO 4.2. In this version we have added support for dropbox (the integration of more services is planned). This new "cloud service" will help you exchange your projects between your various Macs. Hosts can be saved to and loaded from the cloud. 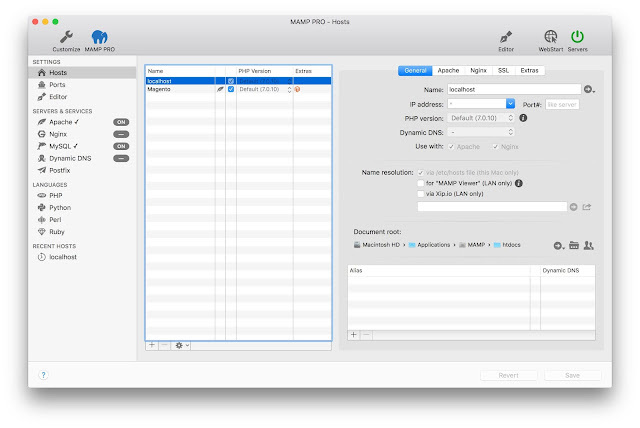 MAMP PRO will save both your document root folder and database data. Your data for each individual host will be saved in a single zip file in your Dropbox. It is not necessary to install Dropbox software to use this feature, you only need a login to your Dropbox account through the MAMP PRO interface cloud settings. You can view your Databases tab to confirm which databases are linked to your host. The public beta version can be downloaded here. While MAMP PRO offers configuration options for the most common settings of Apache, MySQL and PHP, experienced users may want to fine-tune some of the lesser used options. Instead of directly editing config files such as http.conf, php.ini or my.cnf, MAMP PRO uses template files to allow for custom changes to your server environment. You can access your templates through the MAMP PRO menu. A template file is created in ~/Library/application support/appsolute/MAMP PRO/templates when you make a change to one of your templates.There are separate templates for your Apache, Apache SSL, PHP, and MySQL configurations. If you have not made any changes to your templates, your ~/Library/application support/appsolute/MAMP PRO/templates directory will be empty. A popup dialogue will appear when you upgrade. 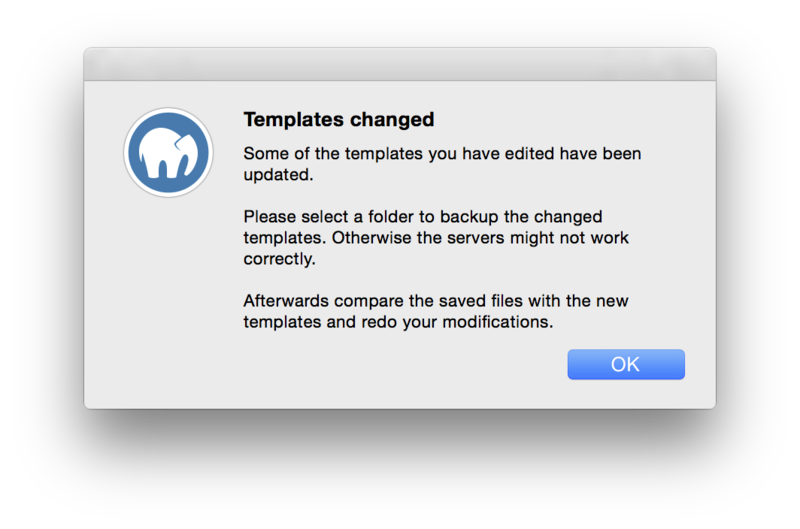 Save your template files. You can use these saved template files as a guide of your previous modifications. New (re)modifications need to be made through the MAMP PRO interface (File > Edit Templates), just as you had done before in your previous version of MAMP PRO. Your MAMP PRO Apache Server httpd.conf file is located in your ~/Library/Application Support/appsolute/MAMP PRO directory. ~/Library is a hidden folder, you will need to unhide it in the Mac Finder or use some other utility to see hidden folders. This file cannot be edited directly. 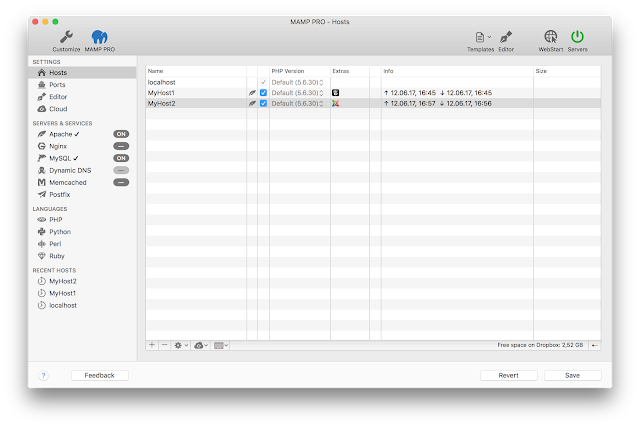 MAMP PRO will overwrite this file every time it starts up the Apache Server. Changes you make to this file will be lost. Modifications to the Apache Server directives need to be done through the MAMP PRO interface, or the httpd.conf template file. You can open the httpd.conf Template file through the MAMP PRO menu. The httpd.conf Template file text and all other template files are color formatted. MAMP directives are in red, text that will be directly written into the real httpd.conf file are black, while comments are brown. The following is an example of a directive that is commented out by default. When you uncomment this directive an apache_access.log file will be created in your /Applications/MAMP/logs directory. You can now see how many “hits” each your hosts are receiving. You could also create an apache_access.log file for each host. Make use a MAMP PRO directive to achieve this. MAMP_VirtualHost_iteration_begin_MAMP loop. Add the following line. Now that this line has been added to your httpd.conf Template file, save your changes and restart your servers. In your Applications/MAMP/logs directory you will now have an hostName_apache_access.log file for each host. Working with MAMP directives can sometimes be tricky. If your Apache Server does not start, then check the real httpd.conf file to verify your changes are syntactically correct. All changes made in the interface, as well as the httpd.conf file will eventually flow to your real httpd.conf file. The real httpd.conf file is located in ~/Library/Application Support/appsolute/MAMP PRO. Check the timestamp to verify this file was just created. To make changes to your ssl sites use the httpd-ssl.conf template file. Changes in this file will be reflected in the httpd-ssl file located in ~/Library/Application Support/appsolute/MAMP PRO.